This error message indicates that you are going to restore a database on another database which are not the same database. For example, you have backup Northwind database and try to restore the backup to AdventureWorks database, the error will occur. To solve the problem, you can use the overwrite the existing database option while you’re restoring. On Restore Database, select Options tab on the left menu. 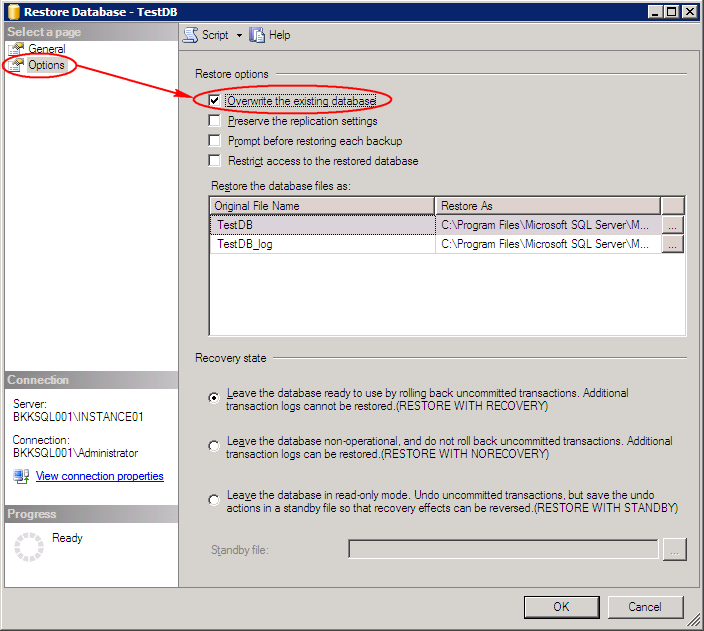 Then, check Overwrite the existing database on Restore options. Note: This option will overwrite any existing data on the targeted database. Try to restore the database, the problem should be gone now. Note: you can also delete the targeted database before perform restore a database. This way also gives the result as same as the solution above. This process of giving answers (with images) is so nice. ohhhh I will marry you!!!! tnx sooo much!!!! This is a great solution. Keep up the great work and thanks a bunch!!! This would work if an existing database did NOT use the same .mdf file of another database that is currently driving the LIVE IIS webpages… how to I work with this situation? JAaronAndersonDotcom…I had the same problem…try using the “Restore Database…” option under the “Databases” folder in the Microsoft SQL Server Management Studio IDE. Select the backup file in the “From Device…” option and type in the database name you want it to create. Also, make sure under the “Options” section that the “Restore As” file paths under the “Restore the database file as:” section are valid paths, otherwise, it will fail. You can also select the “Overwrite the existing database” option as well but I don’t think it is necessary. Hope this helps! Thanks alot……you are so going to heaven! Thank you very much, worked like a charm. No dude this answer dint work for me i got another error saying operating system error 5 !!! Operating system error 5 is about permission issue. Check if you have enough permission. Couldn’t you solve the problem by follow this post? thank u very much…great job.. Thank you dude. your solution is very help me. It worked, the .bak files got restored properly. Your solution solved my problem.Thanks again. I solved my problem with the help of your article. Thanks for your post. Looks like Im missing out some settings/permissions. I am facing operating system error 3 as below. Any suggestions is well appreciated. ” System.Data.SqlClient.SqlError: The operating system returned the error ‘3(error not found)’ while attempting ‘CreateFile’ on ‘C:\Program Files\Microsoft SQL Server\MSSQL.1\MSSQL\FTData\” ..
Great great and great. Soooooooooooo much thank you. Thanks a 1000 Buddy! Blessings. So simple, yet effective. Deleting the database was the solution. Thanks! Thank you ALL for the posting. This information has lead me in the right direction and I finally got my database where it needs to be. Thanks for your explanation of the problem and solution. Thank you man!! It solved my prblem. Thanks its working fine !!! Magnificent web site. Plenty of useful information here. I am sending it to some friends ans additionally sharing in delicious. And naturally, thanks to your effort! thanks ! it works ! still having issues, solved my problem once, but when i again tried this with my new database, problem persists. Help me asap. 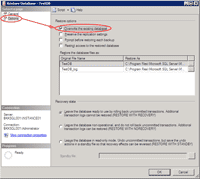 Restore from .bak sql server 2000 to 2005. Eu jÃ¡ tinha realizado todos esses procedimentos. De substituir e a mensagem continua. Sei que esta utilizando algum arquivo que nao esta me permitindo mas como resolver isso? JÃ¡ parei todos os serviÃ§os q poderia estar utilizando o bando de dados que quero copiar e mesmo assim nada. AlguÃ©m tem alguma outra sugestÃ£o? hello everyone, I get a strange error it says system.data.sqlclient.sqlerror: The media set has two media families but only 1 are provided. All members must be provided. (Microsoft.SqlServer.Smo). Can anyone please help me out with that???? Sorry for inconvenience guys. I have solved my problem. Thanks you, finally able to solve my problem. When im restoring ..at 90% i got below error. The file on device — is not a valid Microsoft Tape Format backup set. thank you now i am really happy.bcoz i just face this problem from last 5 days. Funny that I have just come across this issue. Thanks a million! Thank you so much and it looks so simple when I followed your instructions. Thanks a lot for this Great solution.